I4540 1980 - 1997 (17 years) Submit Photo / Document Has 17 ancestors but no descendants in this family tree. [S589] Massachusetts Death Index, 1970-2003, (Commonwealth of Massachusetts Department of Health Service, Boston, Massachusetts, 2005), Michael R Zarr. 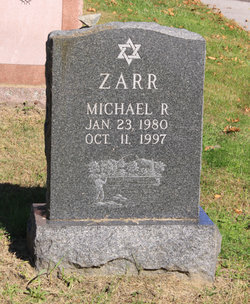 [S775] JewishGen Online Worldwide Burial Registry (JOWBR) (Reliability: 2), 11 Oct 1997.